Epcot brings the music every summer courtesy of its Sounds Like Summer Concert Series. What makes this event unique is that it features tribute bands performing hits of your favorite artists. These bands are about as real as a cover band can be. This year’s concerts will take place from June 7 through July 25 and the seven different acts will perform for a week at a time. 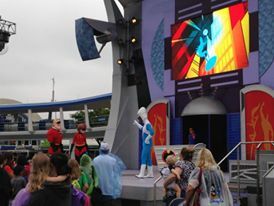 These fun concerts take place at Epcot’s America Gardens Theatre, which is found at the American Adventure Pavilion. Showtimes are 5:30, 6:45 and 8 p.m. daily and shows are included with your Epcot admission. So get ready to shake your groove thing and make sure you stop to enjoy the Sounds Like Summer concert series during your summer vacations this year! To bad summer is only seven weeks long at EPCOT.